Buñuel ends an illustrious career with one of his best films. Surrealist flourishes twist around the simple story of Mathieu (Fernando Rey), a man tormented by sexual frustration. The obscure object of his desire is a woman: Conchita. But she’s actually two women: Carole Bouquet and Angela Molina (and just to make things a little more devilish, she’s actually three women if you include the actress who overdubbed both Bouquet and Molina… simultaneously uniting and further fragmenting the character). 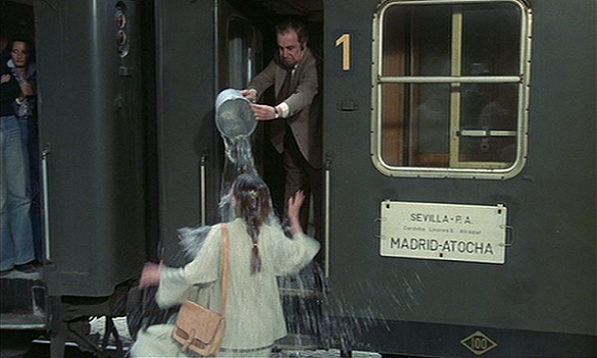 As Mathieu relates his story to a pack of similarly bourgeois train passengers, one can almost feel sorry for him if Buñuel didn’t delight so much in stringing him along. The use of two actresses — a spontaneous, unplanned and brilliant decision — serves many purposes. Bouquet’s scenes are generally those where Conchita is demure, reserved, unobtainable. Molina’s scenes are generally those where Conchita is seductive, passionate, sexual (and it’s worth noting that in the end, it’s Molina who gets the vicious beating). It’s not a perfect Madonna/whore split, but Bouquet definitely leans one way and Molina leans the other. Buñuel never waves a flag to show off his gimmick, it’s done entirely matter-of-fact. Mathieu is oblivious to the fact that this woman has depths and facets. He’s helpless against her caprices because he doesn’t see all of her, he doesn’t comprehend what he’s dealing with. He can make impassioned declarations of love and devotion, but we all know that once she caves in to his lust, she’ll no longer have any sway over him. We know it and she knows it, but he may be totally unaware. He probably believes in his devotion completely, which may be the thing that makes his character just a tad sympathetic. But the world doesn’t care about his horny old man lust, even less than he cares about the world. The rats invade his home, the flies land in his drinks. Terrorists and revolutionaries are annoying inconveniences for him. And then there’s the inexplicable: the burlap sack, the pig child… the world is as inscrutable and mysterious as a woman. It’s all the same to Mathieu, driven only by sexual desire, confounded by the ever-shifting rules Conchita sets up for their love. She will give her heart — and her body — to whoever she wants to, and nothing he can say, nothing he can buy, will give him the upper hand. He’s the one with the desire, and he’s the one that will always suffer for it. Usually he deserves it, but every now and then you have to have a little bit of pity for the dumb sap. Pity, that is, until his frustration turns to violent rage. This entry was posted on February 4, 2013 at 9:24 pm	and is filed under Movie Reviews. You can follow any responses to this entry through the RSS 2.0 feed. You can leave a response, or trackback from your own site. Lovely review. I really wanna see this! I’ve got a friend who watched this and liked it a lot. Of course, when I asked him afterward, he was completely baffled when I talked about the two actresses– he hadn’t picked up on it! Needless to say, I don’t think he was paying a whole lot of attention. I don’t understand it, but apparently that was the case with most theatergoers during the film’s original run, too! Maybe if I hadn’t been aware of it beforehand, it’s impossible to say… but I can’t imagine not noticing.